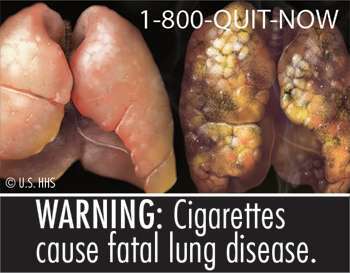 Using prominent, graphic pictures on cigarette packs warning against smoking could avert more than 652,000 deaths, up to 92,000 low birth weight infants, up to 145,000 preterm births, and about 1,000 cases of sudden infant deaths in the U.S. over the next 50 years, say researchers from Georgetown Lombardi Comprehensive Cancer Center. Although more than 70 nations have adopted or are considering adopting the World Health Organization's Framework Convention for Tobacco Control to use such front and back of-the-pack pictorial warnings—an example is a Brazilian photo of a father with a tracheotomy—they have not been implemented in the US. Pictorial warnings have been required by law, but an industry lawsuit stalled implementation of this requirement. Currently, a text-only warning appears on the side of cigarette packs in the U.S.
What proportion of cancer deaths are attributable to smoking around the US?